Let me draw you back to March 9, 2009 – From this day, the Indian stock markets started its secular up-move after witnessing a sharp correction triggered by the US sub-prime crisis followed by the global recession. During this time, the Sensex was quoting at 8160. At this point, it would make an interesting read as to how the constituents of 30-share index have performed from a period of year and half ago to till date. Here is the list of Companies by market capitalisation as on March 9, 2009 and October 8, 2010. What does the above period of comparison from March 9, 2009 to October 8, 2010 reveal? The data captured during the sharp recovery for the period under consideration indicates the changed sentiment and increased optimism among the investor community. The March 2009 period was characterised by the highly pessimistic environment as the global economy had just started to recover from the rot. On the other hand, the latter part of the current data represents extreme optimism out of the India Growth story. A closer look at market capitalisation levels reveal that the Top 2 positions have remained unchanged with Reliance Industries and Infosys Technologies still holding their positions comprehensively. Tobacco-major ITC held strong at the 3rd position during the recessionary phase. However, with the recovery in the markets, the stock has descended to a 6th position now – as a typical underperforming defensive stock. The 3rd spot is now grabbed by ICICI Bank. The bank took conscious measures over the last year, to correct its past mistakes of over-aggressiveness, by deliberately going slow on credit growth to improve its credit quality, cost control and customer service. The bank is also concentrating on gaining higher CASA ratio and improving its pricing power. Telecom major Bharti Airtel which was at the 4th position during the recession slumped to 11th spot on account of intense price-war among the telecom operators. The stock has emerged as one of the biggest under-performers on the bourses. Engineering major L&T has advanced from 6th position to 4th position on account of robust order book and future earnings prospects. The 5th spot has been held tightly by the mortgage-giant HDFC over the period under consideration. ADAG-company Reliance Communications has underperformed big time along with Bharti Airtel. The stock has slumped from the 17th spot earlier to 29th position now. Tata Motors which was lagging at 28th spot a year and half ago has now advanced to 14th position propelled by a significant turnaround in its overseas divisions of JLR. Outsourcing major TCS which stood at 14th position during the recession just about managed to make its mark in the top 10 companies by market capitalisation. Pharmaceutical major Ranbaxy Laboratories which was in the 30th position in the Sensex list of stocks does not find itself in the Top 30 stocks by market capitalisation now. 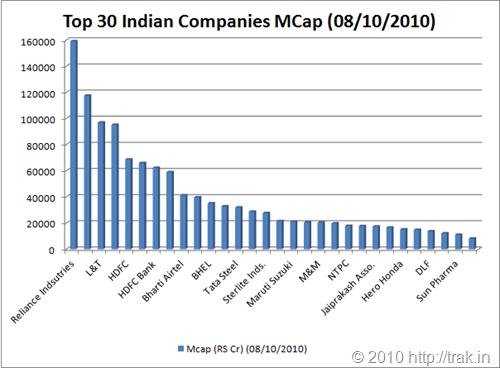 What do you feel about the list of Top-30 Sensex companies? What kind of changes could be seen from here over next few years? I am in whiting list. I m thinking what those people would be thinking now who sold their stocks during this downturn! They must have stopped thinking!!! The great recession was extra-ordinary time and it sucked with it the weak hearted investors. Also, this V-shaped recovery is no less than a miracle, if one recalls that we were at Sensex 8000 levels less than 2 years ago. But, that’s how markets are – uncertain and beyond expectations!